Bib Aprons with or without pockets? Bib aprons are the most popular apron we carry, they are by far the most versatile and always the top seller. 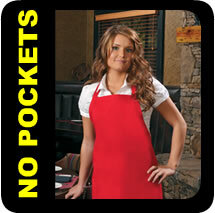 Figuring out if you want your apron with pockets or without pockets is the easiest place to start. Then the number of pockets and length and width of the apron would be next. Our bib aprons range in size from petite to extra coverage and fit a wide variety of people. Lastly would be the color, we stock 20 different colors for fast shipping. If you should need custom made aprons feel free to contact us. It's alright with us if you only need a single bib apron but we also love to deal with anyone needing wholesale bib aprons, contact us for special bulk pricing. All bib aprons with pockets. All bib aprons without pockets. Searching for bib aprons with or without pockets? You've come to the right place. 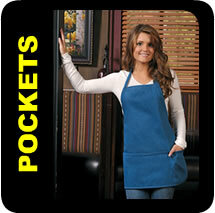 Apron Outfitters stocks thousands of bib aprons with various pocket layouts, apron lengths and styles. Not to mention many colors to choose from. Looking for pink bib aprons, look no further. Bib aprons have been around for a very long time and continue to be the most popular apron style to date. Bib aprons have consistently ranked top choice for restaurants, bistros, diners and food service companies. Likely so, the bib apron has many functional features that serve the user. First, the length of the apron, while it can vary, covers the lower part of the waist keeping pants clean. The bib apron length also provides extra cloth to use as a makeshift rag to wipe or dry hands. Alternatively, the extra cloth can be lifted and held in the hands for use as a basket to carry eggs, bread, logs or anything you need an extra hand for. The overall design of the bib apron is such that it covers 75% - 80% of the body providing maximum coverage and protection from dirt, grime, grease, paint... ect. Bib aprons were used primarily by women in the 1950's for everyday home tasks including cleaning, cooking and gardening. Today bib aprons are unisex and used for countless tasks. Made from many materials including vinyl, the bib apron has even found its place on hunters and fishermen. The handy man can find multiple uses with the denim bib apron for carpenters. Gardeners find it useful for holding tools and keeping clean while sowing seeds. Teachers can purchase child bib aprons for their students, protecting clothing during projects such as arts and crafts or other fun activities. While grandparents can purchase bib aprons for their children and have a fun evening cooking with the kids.